One thing is for certain, if you are out hiking for longer than a day you will need to deal with gathering, treating, and storing water. 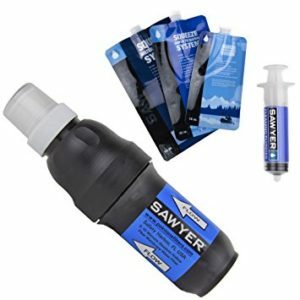 You need a water system and the Sawyer Squeeze filter is one of the most popular clean water solutions for the long distance hiker. 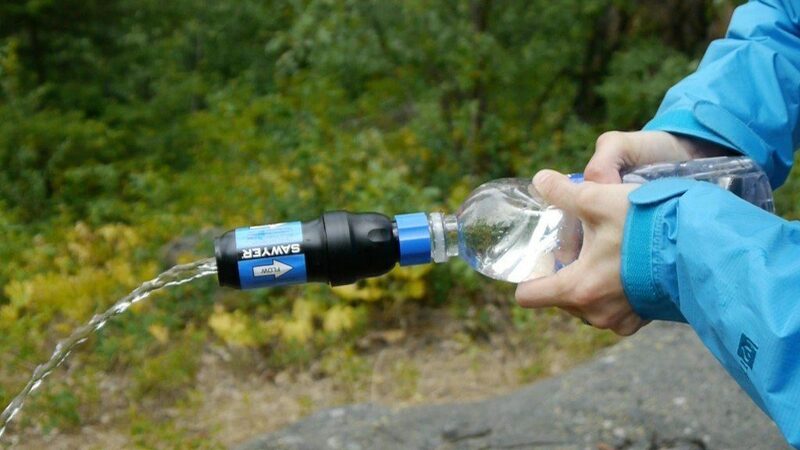 The Sawyer Squeeze is a water filter designed for heavy-duty back country use. The filter weighs only 3 ounces and is the size of an empty toilet paper roll. You can maintain the filter in the field by back-flushing (as needed) with the included syringe or the optional cleaning coupling. The Sawyer can filter over a million liters of water and has a lifetime replacement warranty. There aren’t many things that can derail a long-distance hike quite like having to run off trail for an emergency squat every 10 minutes. Unsanitary conditions and/or tainted water can cause Wilderness Acquired Diarrhea. Because the backpacker is constantly reliant on clean drinking water, filtering potentially tainted water will help keep you walking–as opposed to running. Two of the most common contaminates found while hiking are the protozoa Giardia and Cryptosporidium. According to the Sawyer company the Squeeze is rated to .01 micron (1 micron = 1 millionth of a meter) filtration rate. This means it filters 99.99% of all bacteria like salmonella, leptospirosis, cholera and E.coli. It also removes 99.99% of all protozoa, such as the aforementioned giardia and cryptosporidium. In addition to microscopic bugs, the Squeeze also filters out floaties (visible matter making the water non-palatable) as well as dirt and other harmless particles that make water cloudy. We found that water filtered through the Sawyer almost always came out crystal clear. Tannin tinged water sources were the only exception. In those, the water remained off-color even after filtering. So, what does the Sawyer Squeeze not filter out? The short answer is: viruses and some heavy metals, chemicals, and pesticides. Viruses, which include the AT nemesis, Norovirus, are rarely found in North America wilderness waters. That being said, only purifiers (not filters) or sufficiently boiling affected water can eradicate the virus. And, because the Squeeze is not a charcoal filter, it will not filter out all heavy metal, chemicals, or pesticides. The name gives the method away. The filter is used by forcing water through the utensil by mounting a dirty water receptacle on the correct end of the filter and squeezing the receptacle. While this explanation is straightforward and simple there are a few ways to use the filter in practice. The best method for you depends on how you want to collect water and how much water you will be carrying. The first step is to collect dirty water from a source (spring, stream, river, or lake). You fill one of two types of vessels with dirty water. Either a Smart Water bottle (these range from 1/2 a liter to 1 full liter in size) or a bulk water bladder (typically 1, 2, or 3 liters). The Smart Water bottle is an excellent choice, it is sturdy, the threads fit the Sawyer perfectly, and they are cheap to replace if one wears out. In fact, many hikers will leave the filter threaded on the Smart bottle and drink straight from the filter. If you do not use a Smart Water bottle to collect the unfiltered water then the next option is a water bladder/dromedary bag. This is a great choice if water is scarce, if you choose to carry multiple liters at a time, or you are collecting for more than one person as the bladder allows you to collect more water each time. And like the yarn your parents told about walking to school in the snow (up hill both ways) the same is true for water sources. They always seem to be far off trail and down an even more rugged path than what you have been walking all day. With a bladder you can carry much more water back to camp without multiple trips. 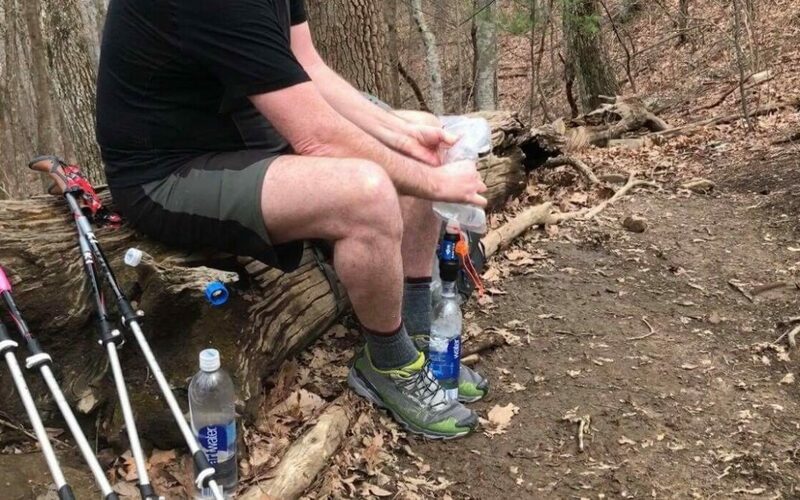 My wife and I each carried two liters of water most of the time on our thru-hike of the Appalachian Trail. We would collect dirty water in a 2-liter bladder and then filter it into (2) 1-liter Smart Water bottles. This worked best for us. The Sawyer bladder(s) that come included with each filter are cheaply made and are prone to leaking. Their durability make them a poor choice for a long-distance journey lasting more than a few weeks. We cut ours in half and used them as a scoop for occasions when a source was only a trickle and thus tricky to collect. Another poor bladder choice is the Platypus bladder. One would think the leading filter company and the leading bladder company would have compatible products. One would be wrong. No, the Platypus’s threads do not match the Sawyer’s, so water–dirty water–leaks from the filter contaminating your efforts of filtering. So, what is the best bladder? Well, in my opinion (and experience over 6-months on the AT) the best choice is the Evernew Water Carry System. This piece of gear is rugged and worked flawlessly with the Sawyer Squeeze. It also had a handy piece of stretchy string on the opening so you could roll the Squeeze and scoop in the bladder and secure it with the string creating a compact system for storage. There are several Sawyer Squeeze mods and hacks that will help you get the most out of your filter, reduce weight, and add durability to your water filtration system. The very first thing we did to improve the filter was to replace the clean water squirt-spout. The one that comes with the Sawyer has a removable cap cover that any normal person will lose within the first day. We replaced this cap with one from a 700ml Smart Water bottle. In addition to not having a cap to lose the replacement spout doesn’t have a plastic flow restructure in the middle so water flows out faster. The next few hacks all revolve around one little piece of gear, the Sawyer back-flush coupling. The coupling helps meet the efficient packers goal of having gear that can serve multiple duties. First, the coupling is designed as an alternative to the provided syringe for back flushing. Thank goodness too! The syringe is bulky, heavy, and used only for back-flushing. With the coupling you can toss the syringe in the trash. Back-flushing the Sawyer Squeeze Filter with the coupling. The coupling can also be used to create a gravity feed system. Just screw your dirty bag on to the filter and then screw the coupling onto the clean side of the Sawyer. Thread a clean and empty Smart Water bottle onto the coupling and hang the set up on a branch. A couple of things help this system: 1) Strategically punch holes in your bladder and attach para cord so that you can hang it. 2) Do not tighten the coupling all the way down, you want a bit of air to be able to get in so the water will flow through. 3) After all this is done give the bladder bag a squeeze to get the liquid flowing. Others have had success with using a tornado tube for making a gravity fed system, but the coupling does the same exact thing and more. Finally, sometimes it is tough to get dirty water from the stream into your bag or bottle. In addition to the scoop, which works but can be laborious, you can easily build a funnel using a Smart Water bottle and the coupling. Cut the smart water bottle so that several inches remain above the drink opening. Screw the one side of the coupling to the cut bottle and the other side to your dirty water bottle/bag. Viola, a funnel. Our thru-hike took 179 days and on almost everyone of those days (minus 21 zero days) we used the Sawyer Squeeze multiple times. The filter never failed or let us down in any way. The Sawyer Mini is also a choice as it saves the hiker an ounce. The drawback is the filter rate is much slower than the Squeeze. As with all equipment for a thru-hike you want something that will last, is light, and just plain works for its intended function. For water filtering, the Sawyer Squeeze exceeds all expectations and I wouldn’t have another filter in my backpack. The only negative attribute of the Squeeze is it can be made useless if it freezes. Twice on our trip our Sawyers slept with us in our sleeping quilts because it was freezing outside. Not a very big negative but one you should be aware of. excellent information, Sunsets! thanks. and so you know, Sawyer is adding a media to its filter that will remove viruses! i know this because our company is working with them, and the media has passed the lab tests. Oh, that is excellent! Thanks for letting me know. Will research this a bit more. Greg, this is an excellent write-up. Very informative and full of practical and useful information. Looking forward to more. Thank you so much! Where do you get that blue connector? Very useful info, thanks. 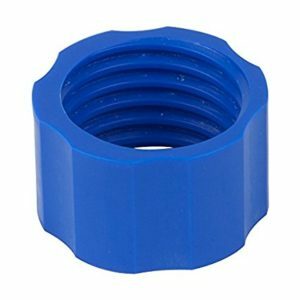 If you use the coupling for a funnel, the coupling would be ‘dirty’ for a while, during which it might contaminate the clean container if used in the other manners you describe.